Sweaters, beds and bow-ties! Oh my! | love lives on. Sweaters, beds and bow-ties! Oh my! Melvin’s birthday weekend consisted of a lot of walks followed by a lot of snuggle time, just the way he likes it! 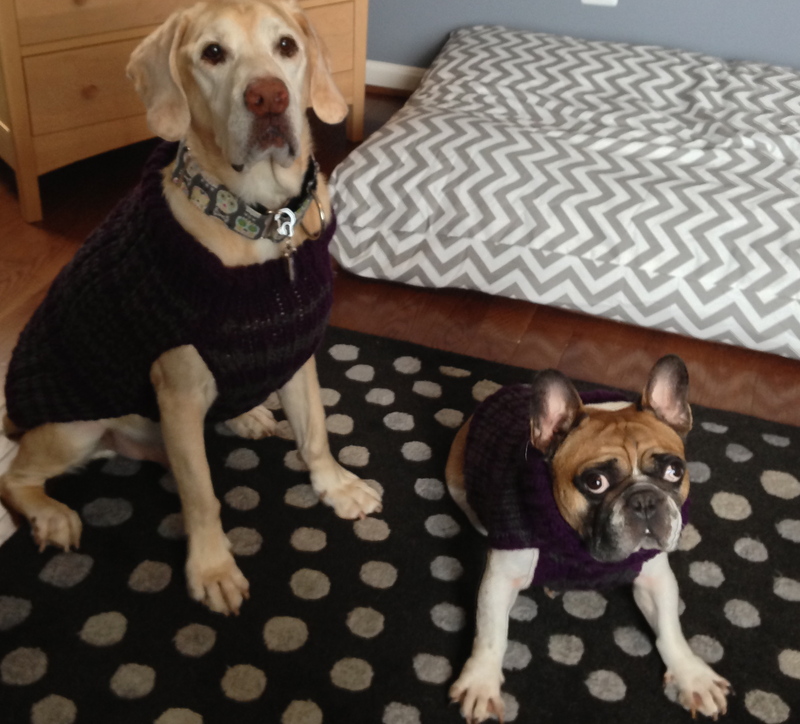 Melvin got his usual birthday gift,a new bed, and both dogs got matching Tiennot’s sweaters! 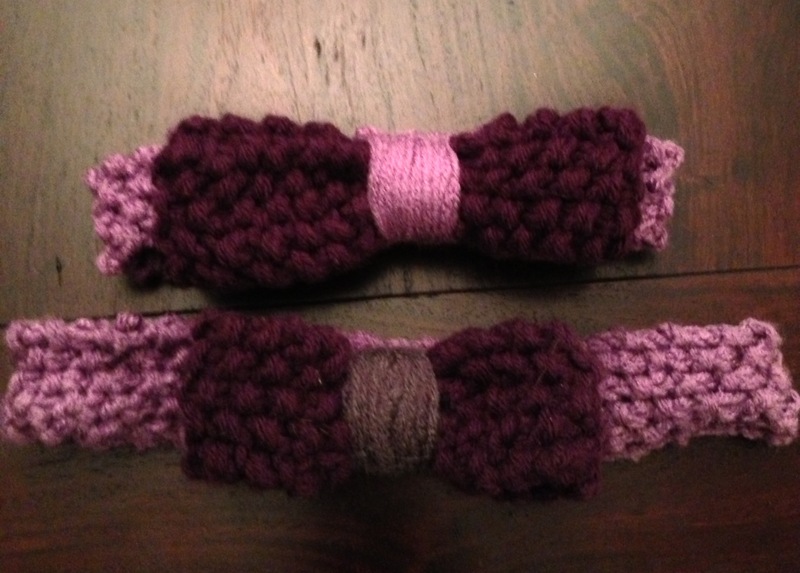 Our dearest Emily from Our Waldo Bungie sent along a gift with this order, matching bow-ties!!!! Yay us!!! 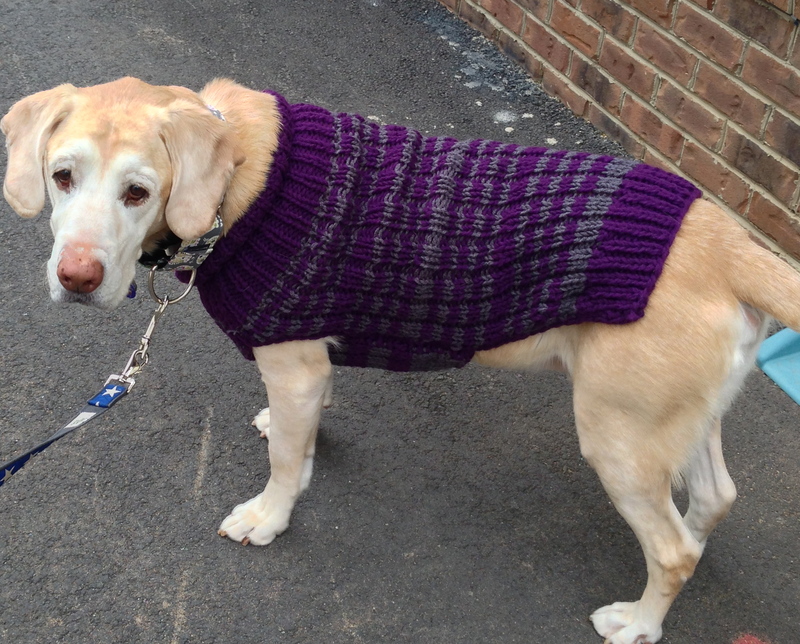 Let me be clear, we LOVE our Emily and our Tiennot Knit Sweaters. The boys each have their own ‘closet’ due to all our adoration! 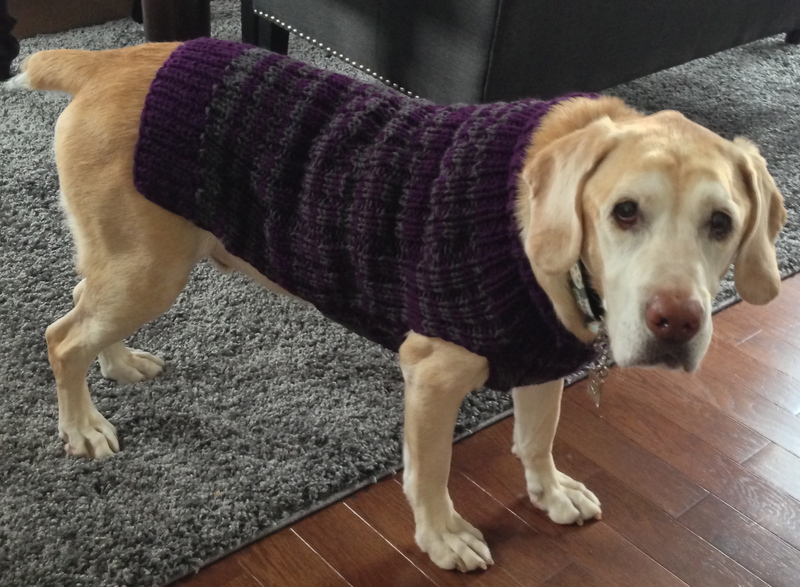 During the sweater modeling session you’ll notice that Melvin tolerates the camera (he’ll do ANYTHING for a treat). Jake on the other hand finds the camera to be terrifying horrifying scary (and treats don’t really make up for the fright of it all), as seen in the second photo (and many of the others)…. New bed for the stud! 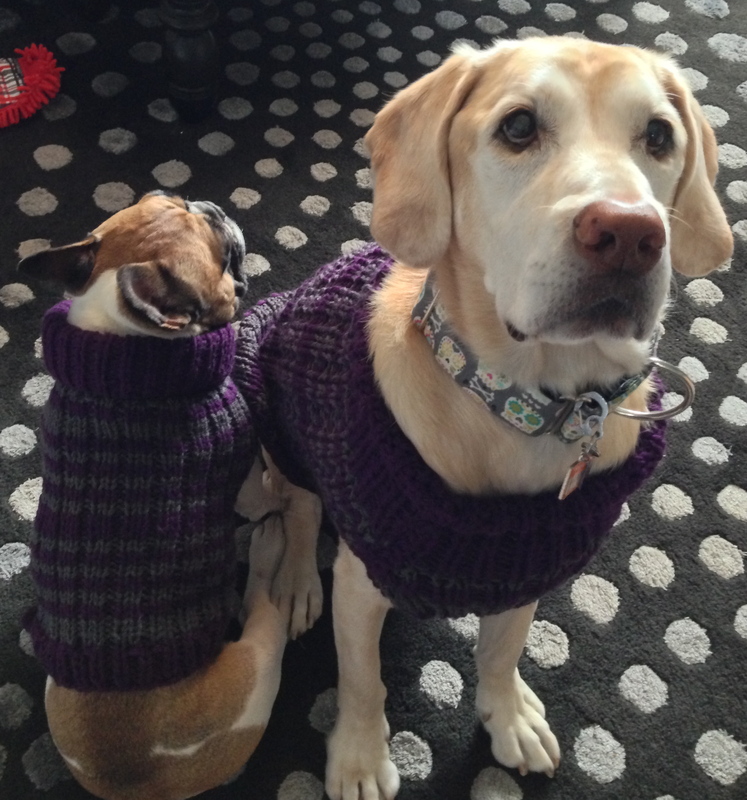 Lesson learned: turtlenecks accentuate head size. Me: Jake, face the camera. Jake: No. There is a very good chance that Jake is in a witness protection program that I am not aware of. No photos of them in their bow-ties YET, but just you wait, they are a-comin! We LOVE you Em & Tiennot Knits!!!! Thank you!!! 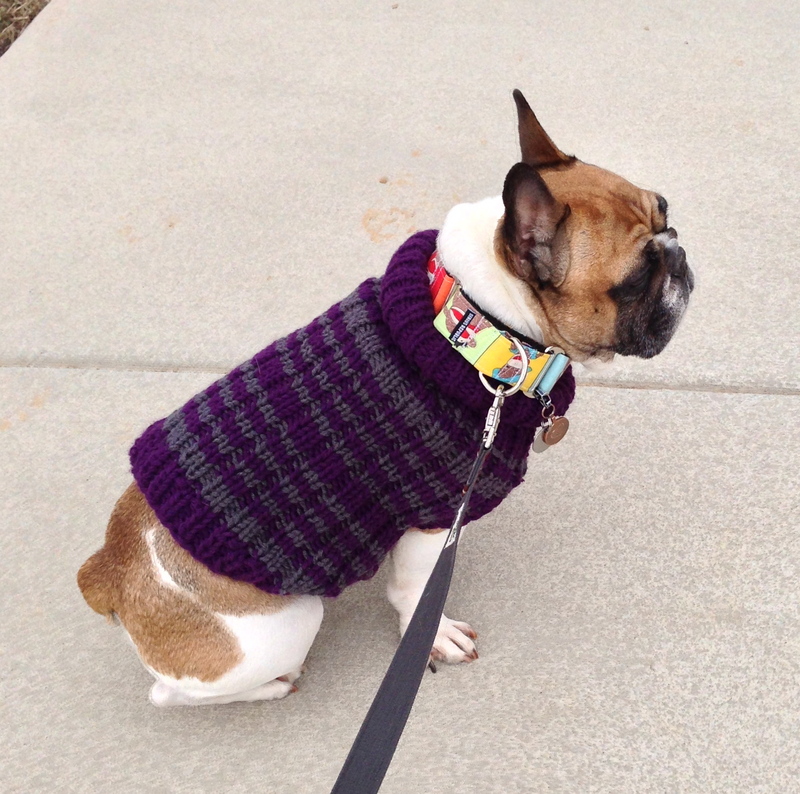 This entry was posted in Uncategorized and tagged custom dog sweater, fashion icons, Tiennot Knits by OhMelvin. Bookmark the permalink. I know! He’s like a living caricature in that thing! You know we have success when it fits over his noggin! They look so great! And I love how they are “twins” Danny Devito and Schwartzenager style (though definitely much, much cooler!). 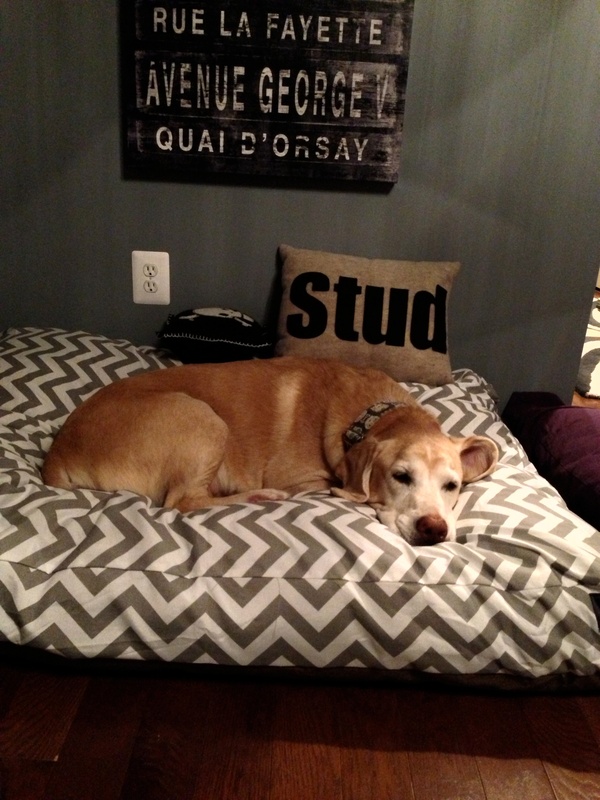 And where did you get that Stud pillow? Totally Danny Devito and Schwartzeneger! That is the perfect analogy! I got the pillow on one of my daily sale sites (thefoundary.com , onekingslane.com, or fab.com). If I see the sale again (they always come back around), I’ll let you know! OMG! 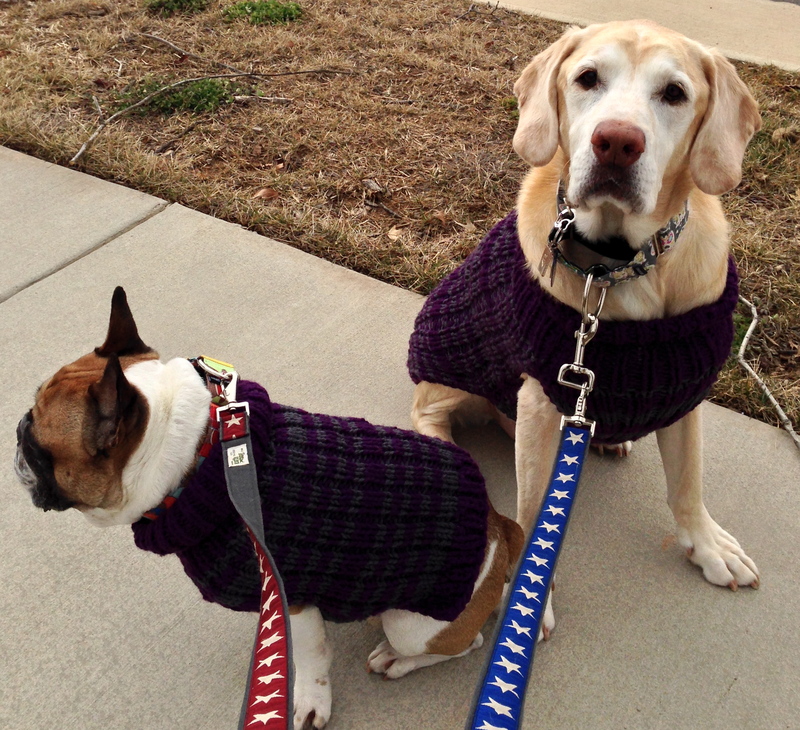 They look SO adorable with their matching sweaters! Pretty much the cutest thing I’ve ever seen! I just love the colors you picked. I can’t wait to see them wearing their matching bow ties. 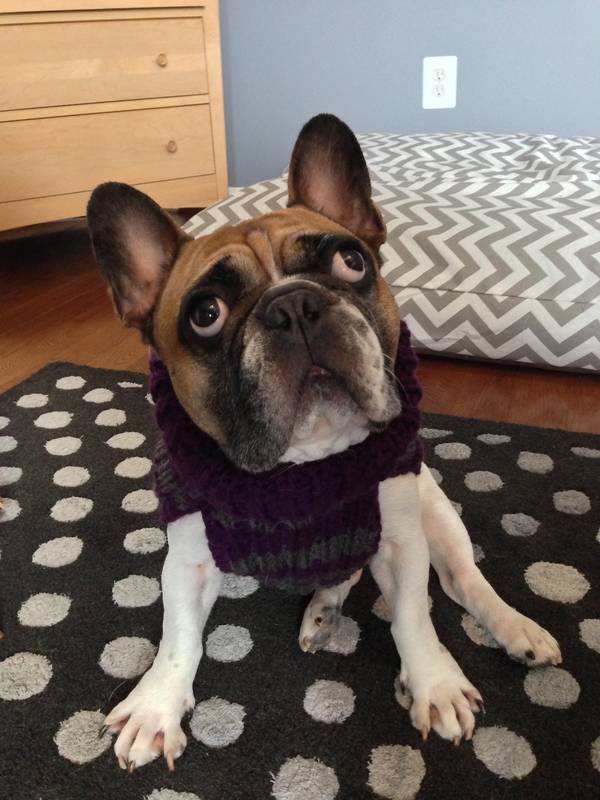 Athena was so lucky to receive a fancy bow tie to match her sweater, and it is the cutest thing ever. 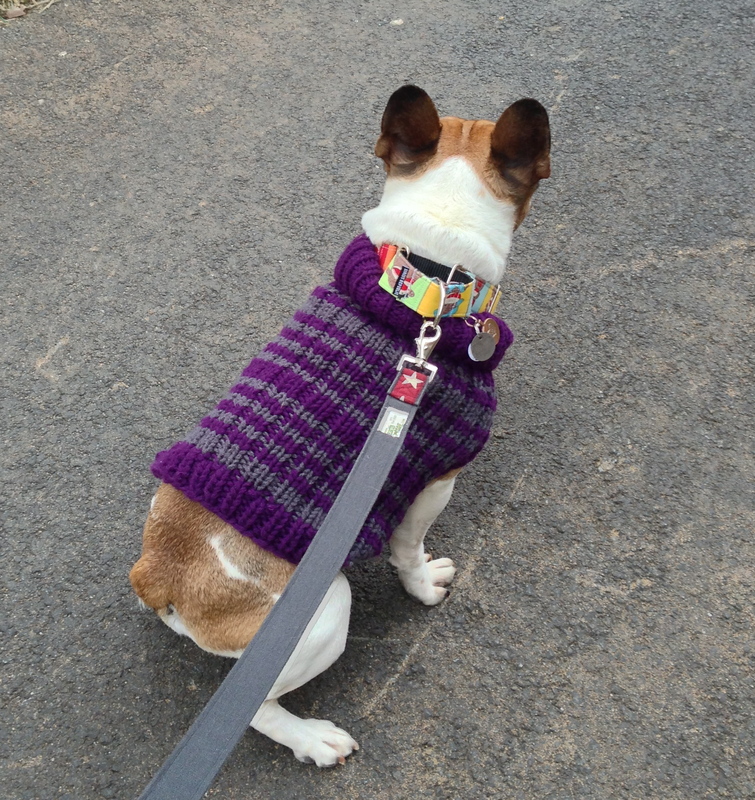 She gets so many compliments when she wears it out and about! We should start a Tiennot Club! To show off all their awesomeness! Very cute, I just love Jake! I laughed at/with him everyday! That pic is too flippen funny!! I am dying This is just rediculous. Please send Jake for snuggles immediately. Hahahahahah, I know!! My little comedian! 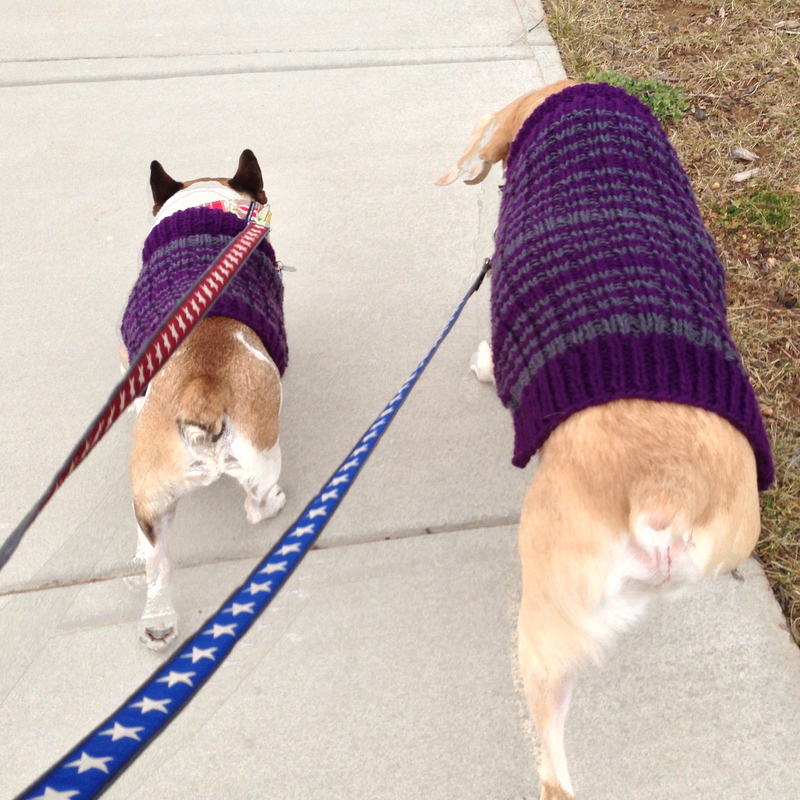 They look so cute in their matching sweaters! Hopefully one of these days Jake will get over his fear of the camera… poor guy. I’m going to have to figure out a way to camouflage the camera! Love your collars too!!!! That sounds like one awesome, I mean pawsome, birthday!!!! That second picture and your caption CRACKED me up!!!! So funny!!! !